The 442nd Regimental Combat Team, shown here in a 1944 photo taken in France, returned home from World War II as one of the most decorated U.S. military units. 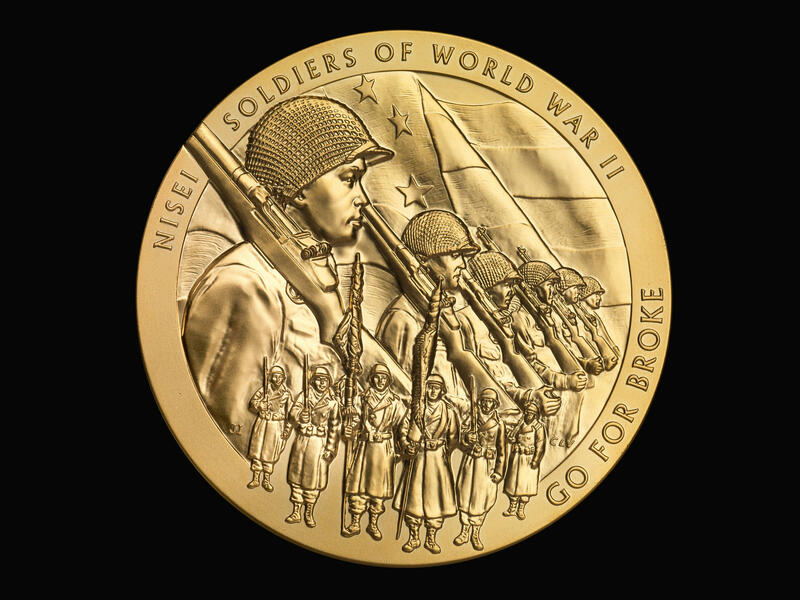 The Congressional Gold Medal honoring Japanese-American veterans of World War II features the motto of the 442nd Regimental Combat Team — "Go for Broke." The Smithsonian's National Museum of American History is marking the Day of Remembrance with a homecoming for the Congressional Gold Medal awarded to Japanese-American veterans of World War II. The highest civilian honor given by Congress, the medal was presented at a ceremony in Washington, D.C., in 2011. Last year, it went on a yearlong tour of museums around the country. Its last stop is the Smithsonian's American history museum, which unveiled a new display for the medal Wednesday. The museum also announced the donation of a Medal of Honor by the family of Army Pfc. Joe M. Nishimoto, who served in the 442nd Regimental Combat Team. The medal will be added to the permanent collection, according to curator Jennifer Jones of the museum's Division of Armed Forces History. 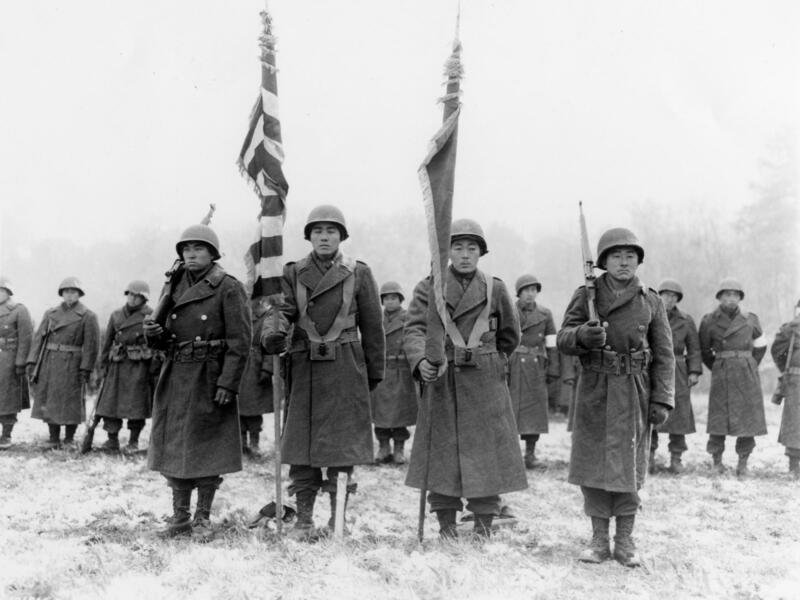 About 19,000 nisei, or second-generation Japanese-Americans, served in the 100th Infantry Battalion and 442nd Regimental Combat Team, as well as the U.S. Army Military Intelligence Service. Many fought for the U.S. in World War II while their families lived behind barbed wire as suspected "enemy aliens" after the Japanese attack on Pearl Harbor. Born and raised in Laupahoehoe, Hawaii, Terry Shima and his family were spared from living in internment camps, which mainly housed Japanese-Americans living on the West Coast. Now 91, Shima, who spoke at Thursday's ceremony, was drafted into the U.S. Army in 1944 and deployed to Italy the following year as a replacement in the 442nd's public relations office. "The display of the Congressional Gold Medal here at the Smithsonian symbolizes the greatness of this country," says Shima, a former executive director of the Japanese American Veterans Association who received the Presidential Citizens Medal last year. "[This country is] so big that it can apologize. It can apologize, make corrections and move on." The U.S. government formally apologized for the internment of Japanese-Americans with the Civil Liberties Act in 1988, more than four decades after the end of World War II. And the nisei veterans — once banned from serving in the U.S. military because of their "enemy alien" classification — were vindicated with the many honors they received, including 22 Medals of Honor and more than 4,000 Purple Hearts. Their Congressional Gold Medal will be on temporary display at the Smithsonian until June 1. Officials say it will later join the museum's permanent "Price of Freedom" exhibition.